Today the team Luna Rossa Challenge 2013 will file a protest before the International Jury of the 34th America’s Cup against the measures introduced by the Regatta Director on Friday 29th of June (Regatta Notices 185 and 189). Luna Rossa considers that, by issuing these documents, the Regatta Director has blatantly breached the rules governing the 34th America’s Cup and has exceeded his jurisdiction and authority. As everybody knows, one of the fundamental pillars of any America’s Cup is the Class Rule, which was proposed by the Defender and accepted by the Challengers at the moment in which they challenge. It can only be changed with the unanimous consent of the competitors (AC72 Class Rule – Art. 4), as it has been the case more than a dozen times in this Cup. This is the fundamental guarantee that preserves the rights of the challengers and prevents the Defender -or any other third party – to change the rules of the game abruptly and/or unilaterally, as the Regatta Director is trying to do in this case: a clear attempt to make illegal our boat just days before the start of the event, with the excuse of safety. Luna Rossa is indeed in favour of the introduction of new and more stringent safety regulations (it has approved 35 out of the 37 Recommendations of the Regatta Director), but the measures regarding rudders, rudder elevators as well as the increased displacement have nothing to do with safety, since their only reason and effect to increase the speed and performance of the boat. 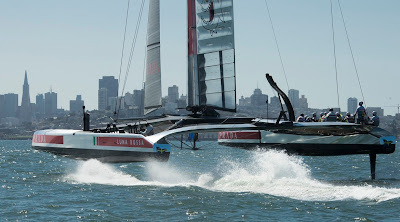 Luna Rossa has also asked that the protest is heard before the first race of the Round Robins, scheduled the 7th of July (Luna Rossa vs. Emirates Team New Zealand). As it was clearly stated at the press briefing in Alameda the 17th of May, Luna Rossa is eager to race in the 34th America’s Cup and be respectful of the rules governing it, but it will not accept any imposition contrary to the rules under which it has challenged.